I have a Windows 8 laptop which I play Sins of a Solar Empire on and I want to move it to my second monitor which is connected via a VGA cable. How would I do that? Windows + shift + ← or → does move normal windows from monitor to monitor but it doesn't move my game for some reason. The game is full screen. Any idea how? Make your "secondary" (the one you want the game to display the game on) as primary. Right-click your taskbar and unlock it. Right-click your taskbar and go to properties, and go to the navigation tab. Drag and drop all your icons from your now Primary monitor to the now secondary monitor. This makes the secondary monitor feel like the primary, and the games start on the "secondary" monitor. Windows should treat this as a "profile" which means that when you unplug your external monitor your icons and taskbar should stay on the correct screen, and when you plug it back in, it should go to the defined settings, but I'm not sure about this. A solution I am using involves Steam. Install Steam and start it up in Big Picture mode, under display settings, select the monitor you want to play the game on. By doing this steam changes the windows primary display temporarily until you leave big picture mode. You can add non steam games to your steam library as shortcuts so you can launch any game(or any other program) via Big Picture which launches on the display you chosen. One option is to switching your machine to "projector only" mode. Hit "windows key" + P and select projector only mode. This will treat your machine as having only one monitor (in this case, the secondary monitor). You won't see any more output on your laptop screen, but you will be able to play the game fullscreen on your secondary monitor without performance loss. Once your game starts, you can turn off projector mode and the game will stay on your other monitor. Fullscreen games tend to be limited to the primary monitor (primary output). You can move windowed games to another monitors at some performance cost though. If you set the window to borderless, it will look just fine. It's free and open source, so enjoy! Move your windowed game across to the desired monitor. Play. Interesting solutions here. But ive never encountered a program that didnt un fullscreen from alt + Enter. No. There is a way. First thing you have to do is configure your monitor setup (assuming you have already). After that remain on the screen resolution page. Highlight the the second monitor indicator located in the box under the heading, "Change the appearance of your displays". Once you have highlighted the second monitor, a little box should appear under the multiple displays tab that says 'make this my main display'. Check the box and click apply. Viola! You can only run the game in fullscreen on the monitor it wants to use, because fullscreen games don't draw the screen through windows desktop manager. Some games, especially newer ones, will let you set the monitor to use from game settings. For those that don't let you do that, you can change your primary display or try borderless windowed or fullscreen windowed mode and then move the game to your other monitor. Depending on the game this could decrease or increase performance. Change the resolution of the notebook display to NOT fit to the game resolution. Set the resolution of the new monitor to the game resolution. Fullscreen should now appear on the "fitting screen". This is how you remain two screens with a fullscreen on the second monitor (but with a commonly smaller resolution as possible on the first screen). OK I think I found a solution. 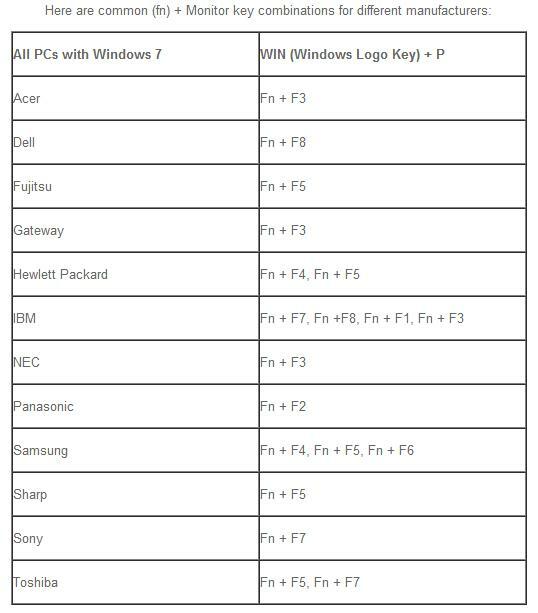 I'm not sure about windows 8, but this worked for windows 7 so I'm posting it in case it still works or some one else happens by this and it helps them. Using the windows screen settings, set the primary window to the monitor you would like to play your game on. This will put all your desktop items (taskbar, shortcuts, etc.) on that monitor. Right click on an empty space on the taskbar and make sure it is unlocked. Left click and hold on an empty space on the taskbar and drag it to a different monitor (which ever one your not using for your game). Select and drag all your desktop shortcuts to the same monitor in step 3.
voila, your ready to go. In order to utilize the other desktop while playing, you may have to make your game windowed vice full screen. In short, the answer is you probably can't, not without using external software. Make it your primary display. Most laptops have a monitor key that is accessed by holding the function (Fn) button. This is used to send the display to the external output and if your lucky, you have the option to send it to both or either one at a time (by pressing it again). Also, most laptops do this automatically if an external display is attached and you close them, but you may have to set it that way in control panel (and tell it not to sleep when closed). Not the answer you're looking for? Browse other questions tagged windows monitor or ask your own question. Is it possible to have a second monitor that is unaffected by fullscreen games on the first monitor? How do I make clicking on the second monitor screen not minimize my game? Does the Nintendo Switch work properly with some 16:10 monitors?